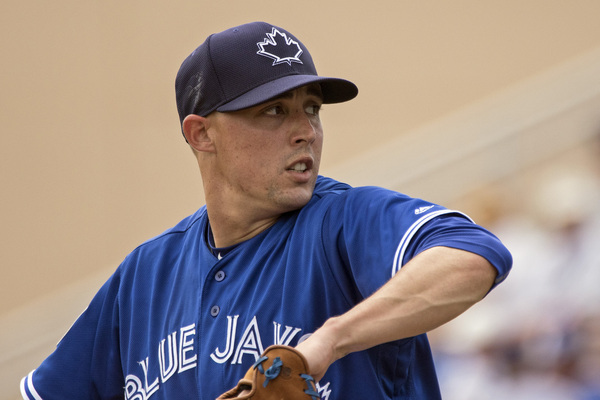 Aaron Sanchez will get his wish – for at least part of the season. But Blue Jays manager John Gibbons also made it clear that the Jays will impose an innings limit on the 23-year-old right-hander. That will likely mean sending him back to the bullpen, where he excelled down the stretch last year, at some point later in the season. Over six seasons in pro ball, Sanchez has never worked more than the 133.1 total innings he threw in 2014. Last year, between 11 starts and 30 relief appearances, he pitched 92.1 innings. Sanchez himself said he has not been advised of a specific innings limit or the timing of a move back to the bullpen. I asked whether he means that he wants to go wire-to-wire as a starter. He replied simply that he wants to pitch all year. And when pressed, Gibbons refused to take the bait about how many innings the Jays have in mind. “We’re talking about that, but we’re never going to come out and reveal what that is. It gives you guys too much red meat,” Gibbons replied. The starter-vs.-reliever debate provided plenty of red meat all spring for fans and media types. And in the Blue Jays’ front office, there was no unanimity about which way to go until the past few days. The decision smacks of a compromise of sorts. Sanchez, who stands 6-foot-4, added 20 pounds during a grueling workout regimen with his buddy Marcus Stroman in the off-season in hopes they could finally become rotation mates. Sanchez came to camp determined to start, and over five spring outings he allowed three runs in 20 innings with 19 strikeouts and three walks. But those who favoured a relief role figured that with Sanchez, Brett Cecil, Drew Storen and Roberto Osuna at the back of the bullpen, the Jays would have a better chance of protecting early leads. And with a strong offence, the argument went, the team could get by with Gavin Floyd, for example, in the fifth starter’s role. By late summer, whether it’s Floyd, or Jesse Chavez, or the just-demoted Drew Hutchison, someone else will fill Sanchez’s spot. Or perhaps, at the trade deadline, another starter will become available, just about at the time Sanchez moves to the ‘pen. I asked Gibbons – who always wanted Sanchez to start ­– whether there were strong views on both sides in the front-office debate. Floyd was Sanchez’s main rival for the vacant starter’s spot. He will pitch in middle relief. Hutchison, who also has pitched well this spring, was sent to Triple-A Buffalo. Sanchez said the strength he developed from his conditioning and weight gain has made his delivery more effortless and his fastball command more precise. When he got the call to the office Monday morning, where was his anxiety level? He said he has not been told where he will slot into the rotation. And Gibbons wasn’t saying either. Too much red meat, probably. Seems like a decent plan. If he’s dominant up to that point, it’ll be interesting to see if the planned strategy changes. Wow- I’m the first to post. This is big news. Loving that John Lott is posting on this site. This should please a lot of folk. I’m happy with the decision. I hope he continues his spring success and gives the Jays another asset. The only thing sadder than being proud of the first to post, is when you are actually the second to post. Yeah, I didn’t achieve my first post goals. Time to pack it in on the comment section. Oh well, opening day is less than a week away. I’m over it. Goals are always important. I wouldn’t be discouraged. As they say, if at first you don’t succeed, maybe skydiving is not for you. I would not be surprised to see Chavez and Sanchez flipped. Chavez has a habit of wearing down but can be dominant when he’s fresh. Give Chavez a light workload the beginning of the year, start stretching him out in July by pigging-backing him on Sanchez’s starts and have them full out flip in August. This could really work. Sounds good to me. This way he gets stretched out and gets some innings against actual MLB hitters, rather than “wasting bullets” in the minors. This way we will know what he really is (thus far) instead of giving in to the idea that he’s just a reliever. Just a thought… why not see if Sanchez could be stretched out all year as a starter – i.e. five starts then skipped, rinse and repeat 5 times, along with a long break (one start skipped to make it ~1.5-2 weeks) wrapped around the All-star break? You could really manage the innings that way and give him time to catch a breath while taking advantage of the other three starter-quality guys (Floyd, Hutch, Chavez).